Wow that best is adorable! ! I don't recognize that. Is it a newer purchase? I'm quite smitten about it! I love the rich browns of this outfit! 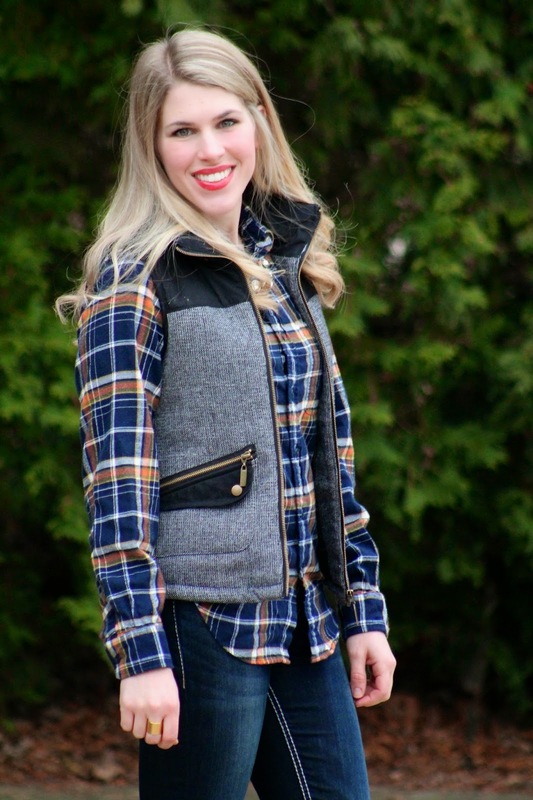 Your vest is fab and it's perfect with the plaid top! I absolutely love that tweed vest!! This vest is gorgeous, love this outfit! We have a snow day today. Last week's weather was such a tease! This plaid is great here! Love the vest! Your layers are so slim and streamlined. I love that vest! The plaid top is so fun too! 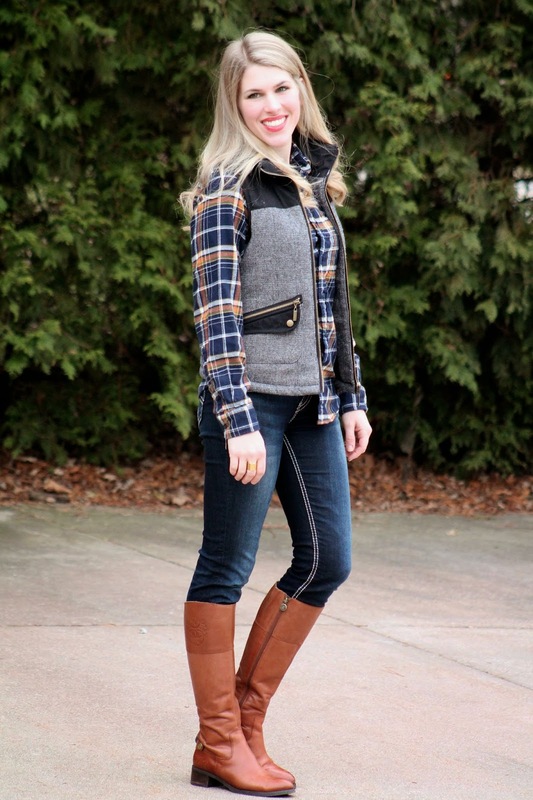 I love everything about this outfit and this would be beautiful in the fall, too with the hints of orange in the plaid and the brown boots. I really like your jeans, perfect dark wash and I like the white stitching. That vest is fab, too! Super cute....love that plaid it is different. Great outfit on you! I love the different textures going on here, and the boots pull it all together perfectly. Great outfit! Wait, wait wait. This vest is from target?! Where have I been? I love it. And dang, what a difference a week (and a foot of snow) makes. Hope you are warm and bundled up! You definitely are looking oh-so-chic in a Tar-jay find! The plaid shirt here is so cute and I love how the cognac stripes on it pick up the cognac boots. Those are some gorgeous boots by the way. I love the colors of your plaid shirt! Your boots really work well with making the colors pop! I am still crushing on that vest! love how you always find nw ways to mix it up!!!! 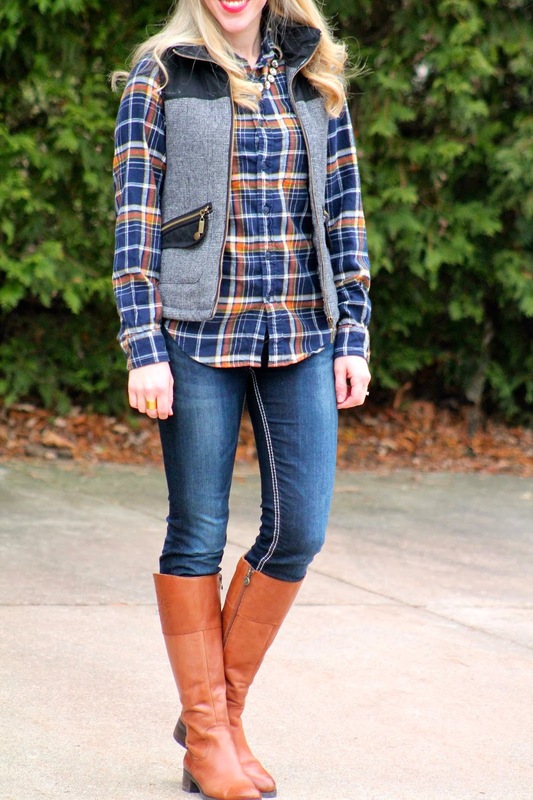 Love the combination of tweed and plaid! Those boots coordinate perfectly. Oh...those boots look so perfectly with this! I love this vest! Vests are one of my favorite layering pieces, and this one is so unique. You look beautiful! Perfect weekend casual! Of course the snow just doesn't seem to want to stop this year. 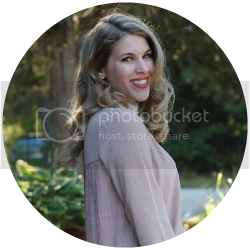 It's getting so hard to stay on top of outfit photos. Love the layers. 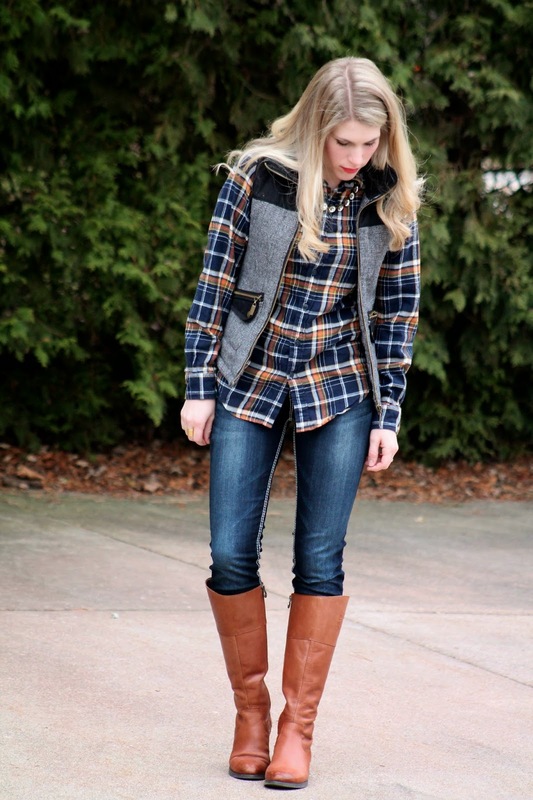 You look great in plaid and love the colorof your boots. I really like this outfit! 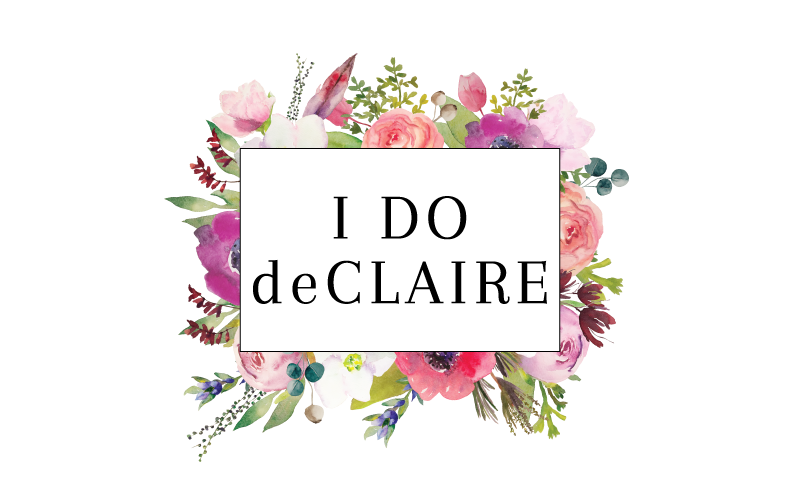 It's so classic and perfect in every way! Wow, you rock in that outfit!